Christmas on the canals can be chaotic. 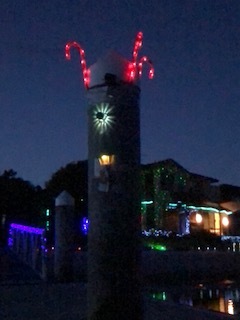 Most houses decorate with laser showers, flashing trees, reindeer and motifs, plus inflatable giant Father Christmases. The reflections in the water add to the display. 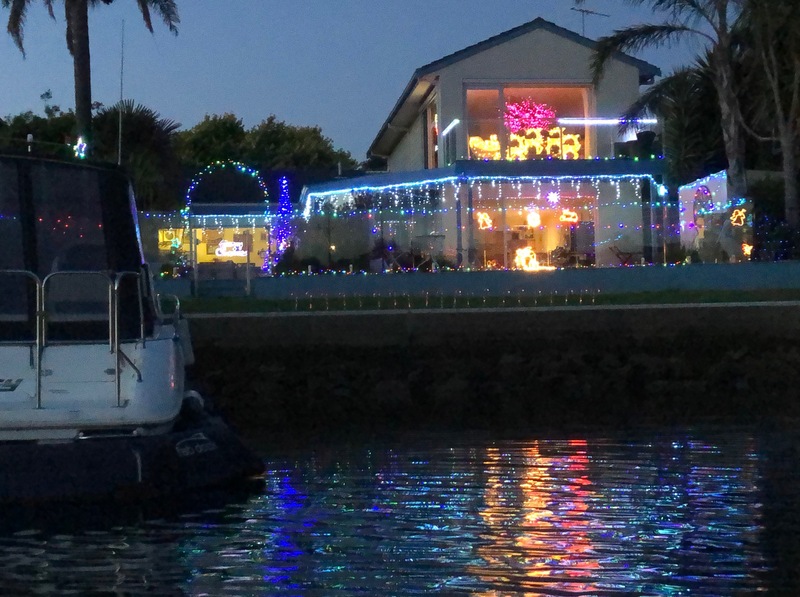 Every year, before Christmas, after dark we have a steady stream of boats of all shapes and sizes, all crowded, some decorated with lights, others unlit, filing past to view the reflected lights. We refer to it as the evacuation of Dunkirk. This year, to add to the confusion, we had unlit jet-skis darting in and out amongst the pleasure craft. I had my fingers crossed that all the children were wearing life jackets. 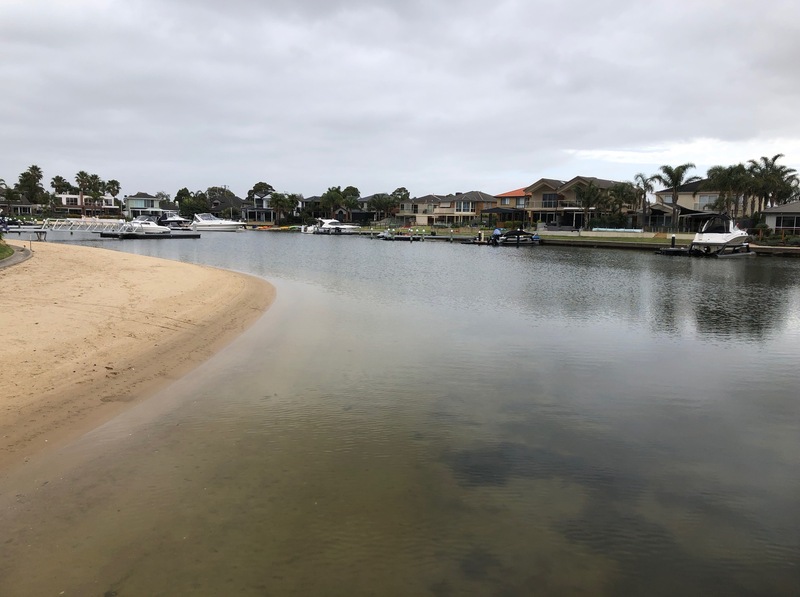 I love sitting in the dark on the deck, coffee cup in hand, watching luxurious pleasure craft complete with gorgeous girls sipping champagne and older nautical men juggle for position with overloaded wooden runabouts packed with Mums, kids and beer drinking Dads. I hope for the best as I watch in disbelief at the risks people take in the name of ‘entertainment’. I decided to wait until now to go take my kayak to see the lights reflected in the water. 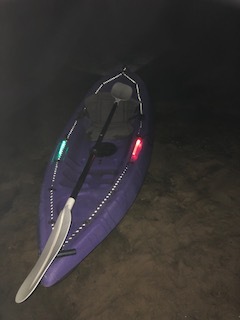 I added flashing port and starboard lights, an LED back light and donned my bright yellow reflective jacket before paddling out onto the canal. There was not a boat in sight and I reveled in the peace of being out on the water, listening to the gentle breeze rustling the palms. A cormorant watched me quietly coast past before diving for his supper. 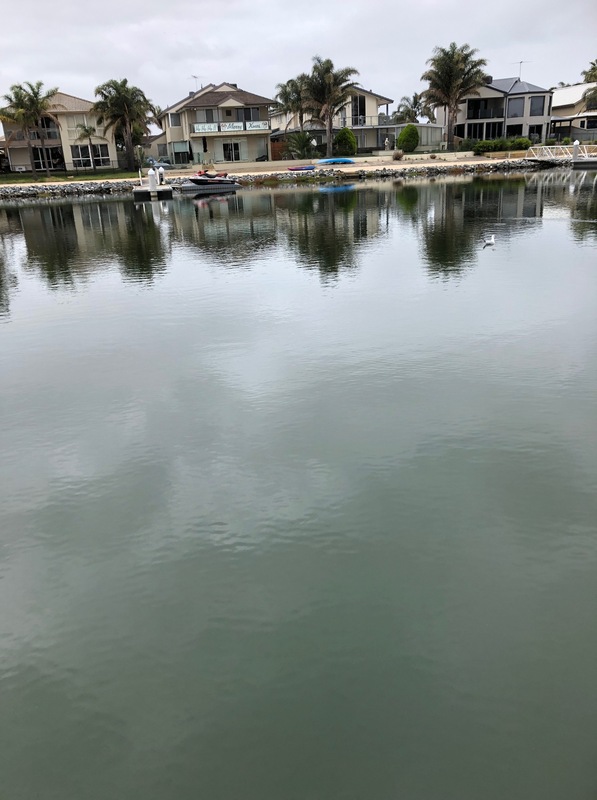 Circles appeared on the water’s surface. At first I thought they were made by bugs but when I floated gently past I realized they were made by fish coming to the surface to feed. I had the canals to myself and delighted in drifting , paddling and admiring the fabulous decorations. I know how long it takes us, with Paul and Marian’s help, to decorate our home. Paddling past many unlit jetties, especially when the moon hid behind the clouds I realized why Paul had insisted on taping four canes to the end of our jetty . The unlit jetties were difficult to see in the shadows and loomed dark and menacing. The grand-dogs Ambar & Tashi, on holidays with us, greeted me on my arrival, but it was with regret that I dragged my kayak up the beach and onto the lawn. Over the summer months I will definitely go again. I know there won’t be any decorations and the houses will have returned to normal but…Oh! …the serenity. And next time I’ll put my port and starboard lights further up so I won’t keep hitting them with my paddle. Lovely post, Glenice. Good luck for the coming year.